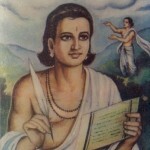 Kālidāsa was a Classical Sanskrit writer, widely regarded as the greatest poet and dramatist in the Sanskrit language. His floruit cannot be dated with precision, but most likely falls within the 5th century AD. His plays and poetry are primarily based on the Hindu Puranas and Hindu philosophy.